One of the bigger issues in pneumatic conveying systems is wear life on rotary valves. Rotary airlock valves are still the workhorse of the pneumatic conveying industry because they are usually the best device out there for metering material while creating a seal to differential pressure. While not perfect at either function (metering or sealing) they are the greatest thing since sliced bread for doing both simultaneously. Their performance comes with a drawback, though. It is based on maintaining tight clearances that can erode over time. We get customer calls all the time asking how to check for wear, and if they can check the tolerances. Can you check the tolerance on your rotary valve? Technically yes you can with a pair of feeler gauges but I would caution letting that be your deciding factor on needing to replace your valve or not. Rotary valves don’t wear out evenly, some wear out on one side and not the other (see image above); it all depends on the material being handled and the application conditions. One of the main causes of wear is blow-by-air which basically means that the rotary valve is not meeting its designed feed rate and most likely needs to be replaced soon. 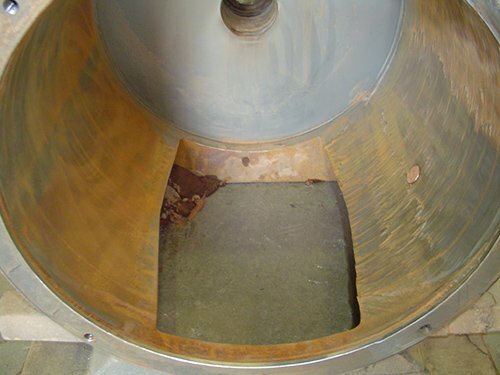 SO WHAT CAN BE DONE ABOUT ROTARY VALVE WEAR? Manufacturers do all kinds of things to make rotary valves more resistant to abrasion. At Magnum Systems we provide configurations with Nedox® chrome, NiHard or ceramic on the bore and end plates and hardened steel or tungsten carbide coated tips. These features can prolong life of the rotary valve by several hundred percent in different applications when compared to more “basic” valves. Additionally Cavity Air Purge and Shaft Air Purge also protect the rotary valve from wear. Another avenue, however, that is all too often ignored by both customers and manufacturers alike is the design of the conveying system itself that the valves are feeding. The biggest single variable on wear is the differential pressure from above to below the valve. To achieve a better price on a system, manufacturer’s often design lines to operate at pressures of 10-12 PSIG in a smaller line that could operate at 5-6 PSIG in a larger line. Think of it as having 3 lanes vs. 4 lanes to drive in for rush hour traffic if it helps. This saves up front capital money, but can cost you money in the long run when you factor in cost and downtime of more frequent rotary valve replacement.